(L to R) 1851 Dragoon Musician and Dragoon. In 1851 uniform changes were adopted that gave enlisted men in ALL branches of the service a single breasted frockcoat for dress– shown here for Dragoons. Our coat features the 19 ounce dark blue field service wool with square corner collar (about 2-1/4" high) with “V” opening in front. Most branches had the solid colored trim, however, Engineers and Ordnance were given cord piping in place of the solid facings– a fore runner to the M-1854 Dress Coat. Functional Cuffs close with two small buttons. Note the special curved trim design on the cuff- see enlargement. Hook and Eye at the throat. Nine button front with two buttons on the back of the skirt. Our frockcoats have raw bottom skirt edges per originals. Half lined to the waist with natural cotton. Two hidden tail pockets but no chest pocket. Optional pad and quilt stitching in the chest area is available. The General Service button with plain shield is used. 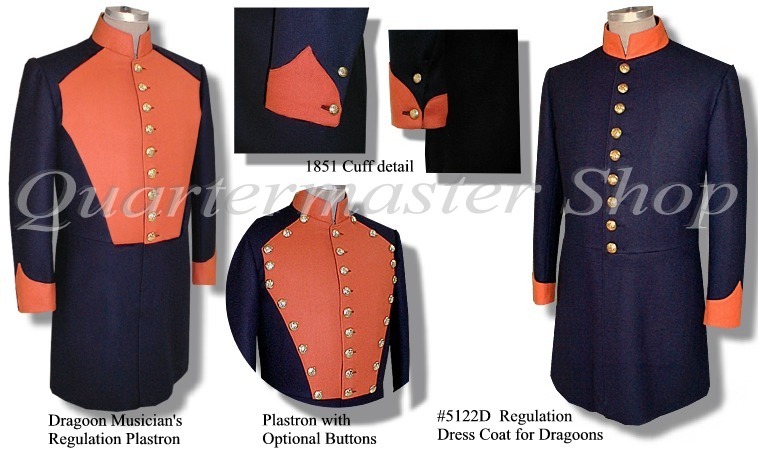 In 1851, Musician’s dress coats were to be in Dark Blue rather than the previous red; and a “plastron” overlay of branch color wool was added to the chest area. The plastron is not removable. Regulations called for the plain edges (see musicians coat at left), but many Band Masters added buttons around the perimeter (see enlargement). If perimeter buttons are ordered, they are inserted in the plastron while it is being attached and not removable.